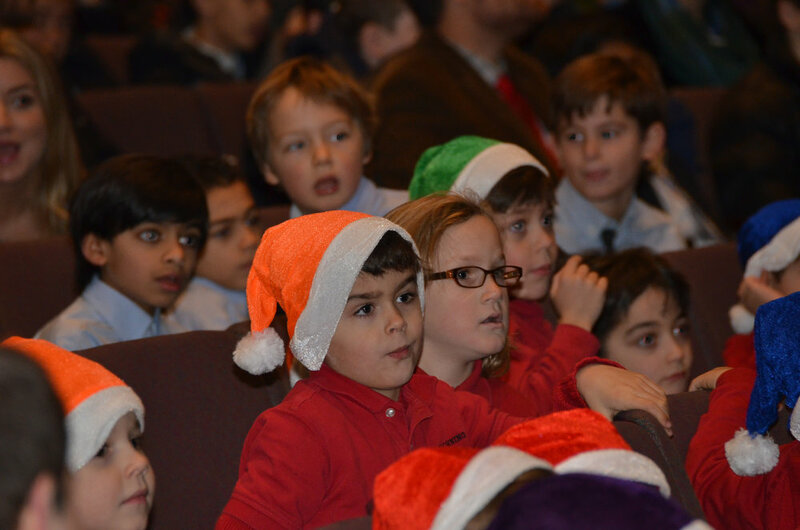 The Browning community joined together on December 16 in Temple Emanu-El for the School’s annual Holiday Program, “One World, Many Voices,” led by Music Directors Lucy Warner and Richard Symons. The much anticipated event, attended by parents and extended family members, began with remarks from Head of School John Botti. Mr. Botti spoke of his fondness for this festive time of year, how pleased he is to be leading the School as our new Head, and how aptly the stage had been set for this particular program by Community Day. Traditional songs were sung by members of the congregation who also enjoyed readings and performances by the boys, including the Form I Hand Chimes, Upper School Chorus, A CaPanthers, Forms I & II Chorus, Grades Five & Six Chorus, Tick-Tock Orchestra, Holiday Strings Orchestra, Starbright Strings, Holly Jolly Dancers, Ovation Orchestra and Browning Jazz Ensemble. Among the reading selections were “Anthem” by Leonard Cohen and an excerpt from a song by David Bowie – a wonderful way to remember these beloved musicians who died this year. Popular holiday tunes, traditional carols, an African American spiritual and a song celebrating Hanukkah were among the musical selections. The Holly Jolly Dancers added to the charm with their “Jingle Bell Rock” number. All in all, the Browning Holiday Program is a testament to the hard work, talent and enthusiasm of so many and is a perfect ending to the year!